Tips from photo and fabric artist Kerby Smith, The Digital Quilter, about selecting cameras for stitchers and other crafters. This is gift season, and many of my students want to know, what is the best camera to give or receive for a fabric artist? We live in a golden age of technology and the choices we have today are abundant. A camera is a tool and like a sewing machine, it enables us to fulfill our creative vision. The better the tool, the easier it is to take a picture or stitch a project. 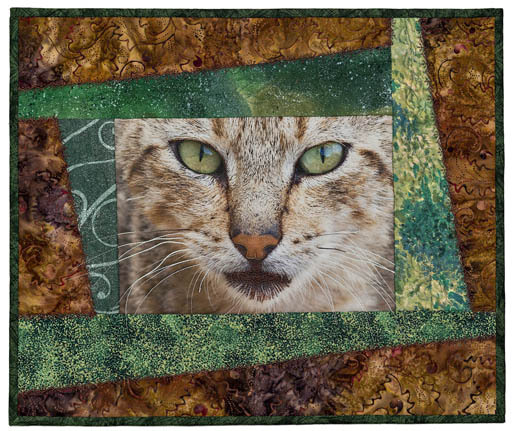 This small portrait quilt features a digital image of a wild cat in Hawaii. The border is based on a log cabin block. Kerby used the BERNINA 750 QE with the BERNINA Stitch Regulator to free-motion quilt it as well as some of the built-in decorative stitches in the B 750 QE. If you sew simple projects on your BERNINA 330, then a point-and-shoot camera might fulfill your needs of taking pictures of those projects. Today, the classic Kodak Brownie, the Polaroid instant camera, and point-and-shoot cameras are being replaced by the photo application in your cell phone. It easy to use your cell phone to take a picture of your sewing project and instantly text it to a friend, post it on Facebook, Instagram, Pinterest and other social media. There are a wide variety of digital cameras that fabric artists can use today. Center is an iPhone. 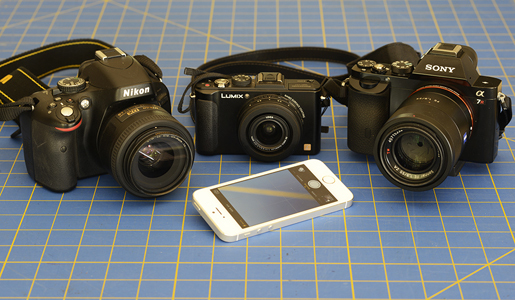 From left to right in the background are Nikon DSLR, Panasonic Point-and-Shoot, and Sony Mirrorless digital cameras. If you need absolute stitch control you might be using a BERNINA 5 Series sewing computer. If your sewing projects are more advanced, you want options like the BERNINA Stitch Regulator that makes free-motion quilting easy. If you want to regulate the depth of field in a photograph, you need the ability to select the camera’s aperture. Or, if you are taking a picture of a child playing, you want to adjust the shutter speed to keep them from being a blur. So, a compact camera with a zoom lens might give you that control. 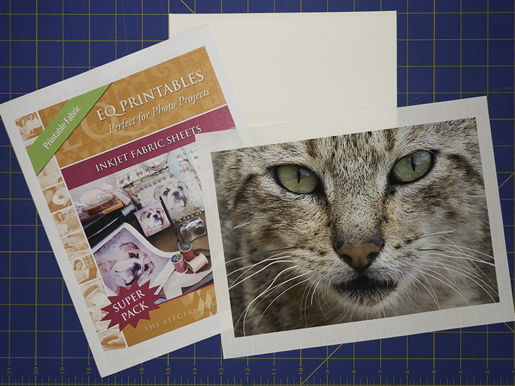 Using a digital camera and fabric sheets like EQ’s Inkjet Printables it is easy to take a photograph and print it on fabric. The process of printing digital images on fabric can be done with an inkjet printer. I stitch my art quilts on a BERNINA 750 QE because it gives me an extra-long freearm with ten inches of space to the right of the needle. The superb BERNINA 9 Hook sews high-precision allows me to get stitches up to 9mm wide. For my picture-taking needs, I not only like to control the aperture and shutter speed, but I also want the quality that I get from a wide-angle or a telephoto lens. So, my preference is a digital single-lens reflex (DSLR) camera with interchangeable lenses. Your answer will help you select the right digital camera to get those images. The good news is that there are thousands of cameras to choose from in your search for the one that will work the best for you. Because we live in an information age, it is easy to research online all of the differences between the cameras. In my experience, the website that does the best job of reviewing digital cameras is Digital Photography Review. They have reviews of point-and-shoot, mirrorless, and DSLR cameras. They review cell phone cameras, not to mention a host of other photographic equipment. An online search is just a starting place because what you want is a camera that works for you and your lifestyle. Once you have done your initial research, I recommend that you visit your local camera store to get hands-on experience with the cameras that you are considering. If the weight of a full-frame DSLR is too heavy for you, then look at the new generation of mirrorless cameras. They are lighter weight and still have interchangeable lenses. The ergonomics of how the different size cameras fit in your hands is also important. If you have small hands, you may not want a big camera. In the same way, a small camera with little controls might not work well for someone with larger hands. You want a digital camera that fits your hands. 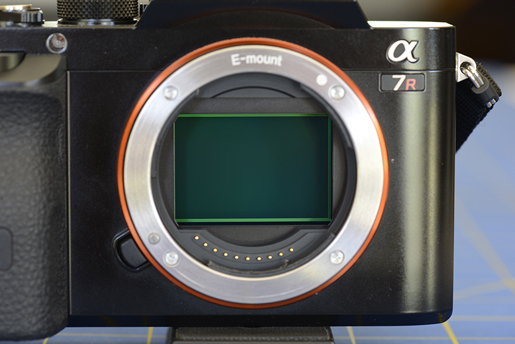 The heart of a digital camera is the sensor that records the image. 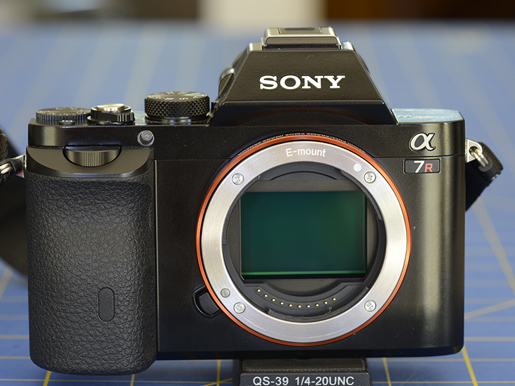 It is easy to see the camera’s sensor in the Sony A7 mirrorless camera when you remove its lens. There are endless jokes about the complexity of the controls and menus on the remote control to turn on the new flat screen TV you received as a holiday gift. Just as the icons on your BERNINA 880 make it easy to stitch out an embroidery design, you want the ones on your new digital camera to make sense as well. The big box stores are all about price, not service. You may save a few dollars on a camera but try to find anyone that will show you how to navigate through the shooting menus as you try to evaluate two different cameras. The dedicated photography stores are still in business because their staff will take the time to show you the difference between menus. When you purchase a new BERNINA sewing computer it includes lessons at your local dealer on how to use it. In the same way, many of the camera stores offer classes that can help you to get the most out of your new digital camera. After you have considered weight, size and logic of the camera’s menu system, here is the next thing to consider. Just like your BERNINA sewing computer, all digital cameras have a computer in them. And the heart of the camera’s computer is the sensor. The thing that separates all of the sensors is their size, which is commonly measured in megapixels. The smallest sensor I use is the 8-megapixel one in my iPhone. The largest one is the 36-megapixel sensor in my Nikon D800E DSLR. Generally speaking, more pixels are better, but you pay for it in the cost of the camera. 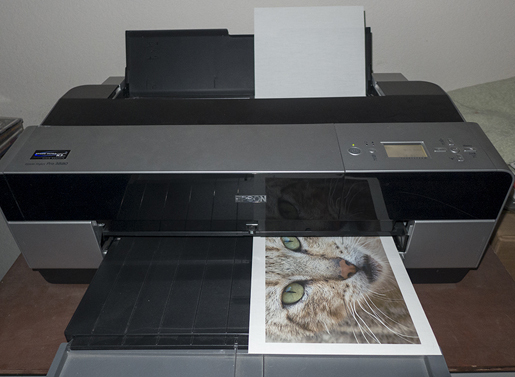 Digital cameras with sensors in the 20-megapixel range will provide excellent results for making prints up to 24×36 inches. As one of my students commented, they want to take a picture that deserves to be blown-up that large. What is the best camera? It is the one you have with you when you want to take a picture.